On March 24, 2015, the City of Lawrence installed a few new trash and recycling bins for pedestrian use along Massachusetts Street at the intersections of 7th, 8th, 9th, 10th and 11th Streets. Public Works and Parks & Recreation Departments are working together to provide this new service in Downtown Lawrence. The new trash bins are black and the recycling bins are blue. The recycling bins are labeled as such and list the following items as acceptable: paper, glass bottles and jars, plastic containers, and aluminum and tin cans. Plastic bags and Styrofoam food/beverage to-go containers are among the items not accepted in the downtown pedestrian recycling bins. In addition, all permitted recyclable items must be empty (no liquids) and free of any food residue. City staff will service the downtown pedestrian recycling bins on a regular basis. City staff will also monitor the recycling bins for contamination levels. Additional recycling bins will be placed in the downtown area if this pilot program is successful. The mixed recyclable materials, also known as single-stream recycling, from the downtown pedestrian recycling bins will be transported to the Hamm Material Recovery Facility (MRF). This single-stream processing facility receives, sorts, processes, stores and transports recyclable materials as well as provides marketing of the recyclable materials. The new downtown pedestrian recycling service is another expansion of the city’s single-stream recycling collection program. In October 2014, city-wide residential single-stream recycling collection service was implemented. The service expanded to city facilities and to public-and-private schools in Lawrence in November 2014. This year the city plans to expand the single-recycling collection service to commercial customers. Program details and service rates for commercial customers will be presented to the City Commission for approval. 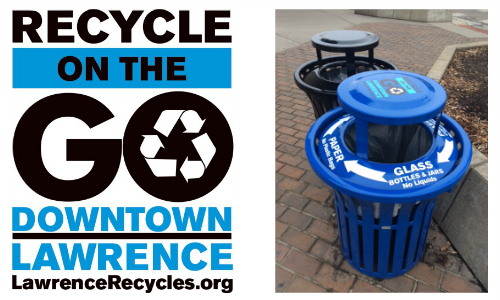 Check out our Downtown Lawrence Recycle On The Go Video!